Many investors, trading floor managers, fund of fund allocators and risk managers have at one time experienced unexpectedly large losses that were not predicted by their risk management systems. Some of these losses may have occurred in portfolios, which according to the risk reports only contained very little risk, perhaps they were predicted to be market neutral, well diversified and, until the large loss happened, had only generated very moderate return swings. Then, seemingly out of the blue, this safe portfolio generated large losses and for reasons that were not detected, nor predicted. Risk systems are today one of the key technologies within financial firms. Risk management guides everything from market exposure to regulatory reporting. Therefore, it is important to know what a risk management system can capture, measure and predict and perhaps more importantly, what it does not capture. The kernel of this article is to show some examples of risk exposures that can fly below the radar screen of risk systems. As we will exemplify risk systems can be blind to, and therefore portfolios vulnerable to, risks that systems are not measuring and do not have the capacity to imagine. What gets measured can be managed and while we may feel safer by improving our risk systems and risk management techniques, they did not stop bank failures in 2008, nor are they likely to prevent or predict the next large dislocation. It is therefore important to broaden our scope of risk awareness to what lies outside the risk management system’s reach. It is to be noted that some of the risks or biases we describe may be intended components of an investment strategy. Such a discussion about investment expectations and understanding between managers and investors lies outside the scope of this article. Even if it is rare, we have come across cases where a risk or bias was not known or understood by the portfolio manager himself. In such cases, both manager and investor are equally exposed to possible negative surprises. The point we want to make, by illustrating with some examples from our own experience, is that an investor should never rely on risk systems to provide more than a partial coverage of all the risks embedded in investment portfolios. The investor needs to look beyond his risk reports and try to find what other risks and biases he may be exposed to in a portfolio or strategy. This is a never-ending task and requires experience, imagination and creativity along with the hard work of analysing the traditional risk reports. The below list of hidden risks and biases are by no means exhaustive, but all examples are real and from our own experience. We focus on market risk, rather than operational risk issues. If these examples succeed in sowing a seed of sound doubt and this triggers a more holistic risk approach, then this article has achieved its aim. For any particular stock, its Beta is more or less stable over time. The stability of the Beta is also more or less sensitive to various changes in markets. In a certain market environment, the Beta of some stocks may increase a lot, while for other stocks, their Beta implodes. 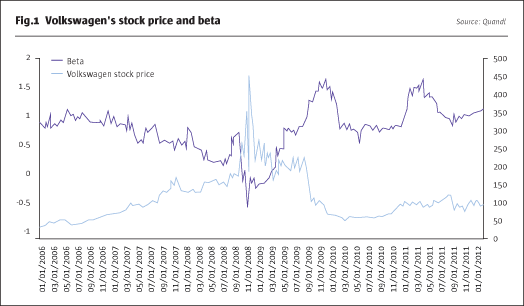 A portfolio of stocks may contain long positions and short bets with opposite Beta dynamics. If the longs and shorts react very differently to a certain type of market downturn this may then cause larger losses than what the risk system’s portfolio Beta estimates suggests. To have different Beta biases on the short and long side of the portfolio can indeed be a conscious part of an investment strategy. It does however, result in a portfolio with a different and in some respects higher risk than the risk report shows. For traditional portfolios, this is likely to be a minor problem. For active, more concentrated and leveraged strategies, a difference in Beta behaviour can result in outsized negative results. As an extreme example, consider the stock of Volkswagen, subject to a takeover bid by Porsche combined with a so called short-squeeze. Volkswagen’s Beta both imploded and then exploded during the financial crisis of 2008. Needless to say, the possibility of a short-squeeze was not captured by risk-systems. For a concentrated, leveraged hedge fund portfolio with different Beta sensitivities on the short and long side, this hidden bias can translate into a downside potential that is multiples greater than the upside, even when, according to the risk system, the overall portfolio is Beta neutral. Complex and diversified portfolios across global fixed income, currencies, commodities, equity indices etc. may, in spite of great diversification and active trading of positions, contain a persistent credit spread. Lesser country credits may be over-represented on the long side whilst the shorts are in more highly rated countries. Such analysis requires access to position data on a preferably daily basis, which is not always available to investors. A persistent rating bias can be the source of a significant credit carry income. If this carry is persistent, the performance and risk of the strategy should be viewed as one-part passive credit spread and one part the result of active investment decisions. The investor may want to quantify the rating bias and include it as a credit spread exposure in his portfolio models and consider using different pricing models for the passive and the active part of the strategy. If options are allowed in an investment strategy alongside its underlying assets, there are several ways in which positions can be composed which provide a premium income for taking on unlimited risk. Non-linear instruments such as options are difficult to integrate in traditional risk system’s reports. This risk is similar to the credit carry exposure described above. It has a return pattern of slowly accruing profits, only to suddenly lose years of profits during one volatility expansion. Selling volatility can be a profitable strategy over the long term, but requires deep pockets to stay solvent through the drawdowns. A position of net short volatility is likely to generate its largest drawdown when equity market decline. 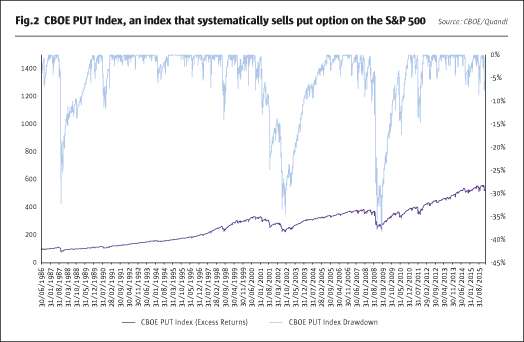 Depending on the sophistication of the risk system, even some basic option positions may not be adequately captured. Straddles (selling put and calls around a strike) or calendar spreads (selling options for one expiry and buying it for another) are hard to capture by anything other than a dedicated option risk system or one capable of handling path dependency. In a more traditional risk system, these positions may well look like a riskless exposure, while they certainly are not. When the dotcom bubble burst in 2000, many investment strategies that were not investing in Internet stocks were as badly affected as those that did. There was little or no diversification effect to balance out the large losses in Internet stocks. Apart from the obvious reason that market panic affects all risk assets, there was also a phenomenon, which was more extreme than ever before, single sector concentration in stock markets. The extreme valuations of Internet stocks buoyed the entire stock market index. To piggyback on this, a number of companies re-engineered or just re-labelled part or all of their business as Internet related. We can today see something similar, with the so called ‘FANG’-stocks (Facebook, Amazon, Netflix and Google). While the underlying companies have a different business model than those common during the dot com years, the price increase in these four stocks have had a disproportionately large impact on the S&P 500. Risk systems were unable to adequately represent the new risk inherent in the Internet bubble. It is one of the weaknesses of all risk systems that they believe the markets are correctly priced even when there is a no connection with normal business logic and rationality. Risk systems are, as mentioned before, not very good at catching things that haven’t happened before. Style drift is when a manager is changing the ways in which risk is taken away from the original investment strategy. Not all style drift is bad. However, it may change the risk profile and sensitivity to market events from what was intended and communicated to investors pre-investment. An example; a systematic investment strategy, based on quantitative models, gives the portfolio manager more discretion to take active investment decisions and override what the models tell him. This may go undetected in spite of dramatically altering the risk taking and leads to a very different portfolio behaviour in relationship to market events. For investors looking to have exposure to a particular investment method adherence to the original trading methods is crucial. Style drift is difficult to detect over short or even medium term periods even with good transparency as it requires deep analysis as well as pre-set and explicit expectations and follow-up of how a manager implements trades and takes risk. A fund that is governed by a VaR framework is mostly better risk managed than one that is not. VaR risk measures are trying to predict risk based on past information. The underlying assumption is that historical data contain information with predictive value for assets future price behaviour. When there is a change in market behaviour or a new market phenomenon appears, the predictive power derived from historical data will be greatly reduced. Uncommon events are often the reason for large market drawdowns or dislocations. So when a measure for how much a portfolio can lose is most needed, then VaR is the least useful measure for that. VaR is a necessary tool, but should not be confused with giving the answer to how much of the invested capital is actually at risk of being lost. Even in normal markets VaR has some serious flaws which the risk report reader must be aware of to not put too much trust in the numbers the VaR models produce. The way VaR calculates risk means that risk is at its lowest after periods of benign correlations and declining volatility. The consequence is that higher than usual absolute amount positions are allowed within a given VaR limit. If a large enough number of traders and managers actually take positions up to this higher limit, they collectively become vulnerable to VaR- based limits shrinking. This overall vulnerability to a deterioration of benign correlations and volatility is not captured by an individual VaR based risk system since it does not know the positioning of the overall market. Thus the risk for market wide selling pressure is not taken into account when estimating the risk of an individual portfolio. The actual risk of large losses may therefore be at its’ greatest when the VaR risk report says it is low. In the words of Hyman Minsky, “stability is destabilising”. The data needed to know overall market positions is mostly not available, so the only tools available to handle this risk are personal insights and common sense coupled with experience. For any one instrument in a portfolio, risk systems typically use opening and closing mark-to-market prices in combination with the number of instruments held at the same times to calculate the profit or loss of that day. It is quite common that there are discrepancies between this method of calculating and the actual daily profit and loss. Discrepancies between actual profit and loss and that calculated by systems can be difficult to break down and may remain unexplained and even build up over long periods. One activity, which may cause such discrepancies is intraday trading. Good interaction between the risk department and accounting/operations can detect this. It is more difficult if front office and risk measurement are not in the same organisation. Intraday trading can therefore be unrecognised as the performance, and risk contributor it is. While intraday trading may be a way for the investment manager to generate additional returns, it also generates additional commission expenses and can mean that higher risks are being taken during the trading day than what is seen in the end ofday risk report. Intraday trading activities are hard to detect and require a different approach for risk systems to provide correct and accurate analysis of actual risk and attribution of investment performance. Measurement and management of investment risk have taken quantum leaps over the past decades. The increased sophistication of risk systems has given rise to a new risk: that of having too much confidence in the risk reports. We may be blind to the risks that are not seen by the system. To find the unknown unknowns still requires a human process where experience and creativity are combined. With our examples, we have illustrated the existence of significant risks that exist even though they are undetected by risk systems. The prudent investor will consistently be on the lookout for any and all risks to his investments, including those are not yet known. He continuously attempts to detect, explore, monitor and ultimately manage the unknown unknowns. We hope this article in some small way can contribute to highlight the importance of this work. Rikard Lundgren is an Independent Director and Chairman of Skandinaviska Kreditfonden AB, Scandinavian Credit Fund 1 and a Non-Executive Director of European and Asian Special Credit Opportunities Fund. He was until recently the CIO and partner of IMQubator, an APG funded seed investor in start-up hedge and private equity funds during which time he chaired Romanesco Capital and the IAC of HPE Growth PE. He has been Head of Investments at Folksam, a Swedish insurance company, a Non-Executive Director of Informed Portfolio Management (IPM), Shepherd Capital, Catella Kapitalförvaltning and senior advisor to Unigestion, a Swiss fund of hedge funds. He has been CEO and CIO and head of the Finance division of Inter-IKEA Treasury S.A.
Linus Nilsson, CFA, is quant risk specialist with ABN AMRO. Most recently he held the position as Fund Manager / CIO for John Locke, a French hedge fund. He has worked for IMQubator, MAN Investments, Norges Bank and RPM AB in both investment and risk related positions. He holds a MSc in Electrical Engineering from Chalmers University of Technology in Gothenburg and a MSc in Financial Economic from the University of Gothenburg. In addition, he also holds a number of industry designations, among them the CFA. The views expressed in this article are my own and do not necessarily reflect those of my employer or its clients.